Christmas in Germany is a magical time. The four weeks leading up to the 25th are filled with Weihnachtsmärkte (Christmas markets), Glühwein and much nicer than usual Germans. However, Christmas Eve and Christmas Day can be a little quiet as these are thoroughly family holidays. So where to go to feel the yuletide? These are some of the nicest places to spend Christmas in Germany to fill you with holiday cheer. Not all Christmas markets are created equal and the Nuremberg Christmas Market may very well be the best in the land. Located in the heart of the Altstadt (old town), watch for the angelic Christkind, an ambassador of the city among the red and white striped booths. Shop the 180 traditionally decorated huts for hand-made goods and order some sustenance in the form of Nuremberg Rostbratwurst, a warming drink and Lebkuchen (gingerbread). Berlin has many lovely Christmas markets, but if you're in the city on Christmas Eve, here's a special event you'll want to check out. The Protestant Berliner Dom is located on Museuminsel in Mitte. The impressive structure dominates the foreground with the Fernsehturm and River Spree behind. On Christmas Eve, the cathedral is open to the public for a concert. Hushed masses make their way into the layers of pews and then the singing begins. Familiar carols like O Tannenbaum echo throughout and visitors know the true meaning of Gemütlichkeit. 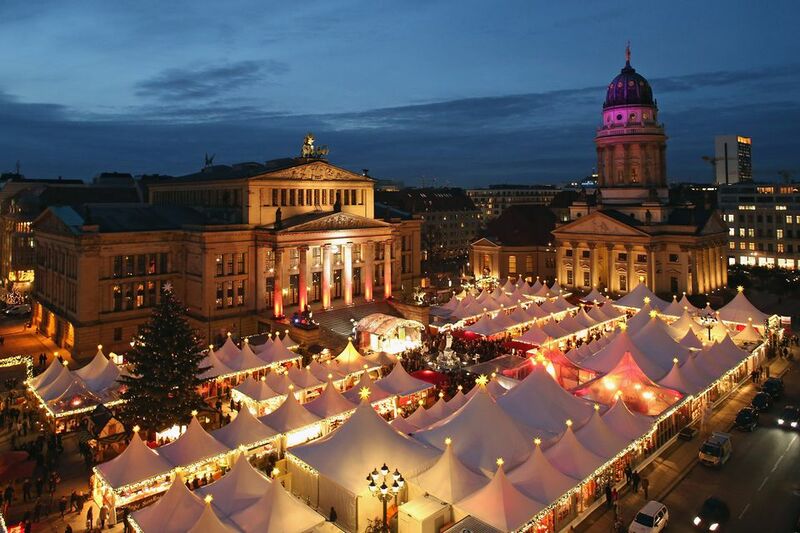 Dresden holds the oldest Christmas market in Germany, dating back to 1434. Dresden's Christmas market is famous for having the world's biggest nutcracker and a huge Christmas pyramid, a 45-foot high wooden carousel with life-sized angels and scenes from the Nativity. If you arrive before Christmas Day, check out the Stollen Festival on December 5. An enormous Stollen (traditional Christmas cake) is presented, weighing 4 tons and measuring 13 feet in length. At any other time, just buy a normal-sized cake to enjoy yourself. This medieval town that time forgot is the perfect place to celebrate Christmas in Germany. A major tourist stop, it empties out at night and is straight out of a fairy tale with a dusting of snow. The town hosts its own Christmas Market within the walls with adorable treats like a Schneebälle ("Snowballs"; Dough fried and covered in a variety of sweet toppings like confectioner's sugar, chocolate, and nuts). Not there at Christmas? It is Christmas year-round in Rothenburg. The global brand Käthe Wohlfahrt has its headquarters here (Herrngasse 1) with three floors underground of ornaments and decor. The Christmas Museum covers tree decorations through the ages, the first Advent calendars, and antiques. This charming city gets has many lovely places to visit, including its traditional taverns, Rauchbiers will warm you from the inside. Plan a visit to the cathedral and UNESCO World Heritage center in this "Franconian Rome". For Christmas, Maximiliansplatz is illuminated and decorated with a traditional market surrounded by Bamberg's Franconian half-timbered architecture. Walk the Route of Nativity Scenes which consists of over 40 sites and about 400 Christmas cribs in a mix of historical and modern scenes.